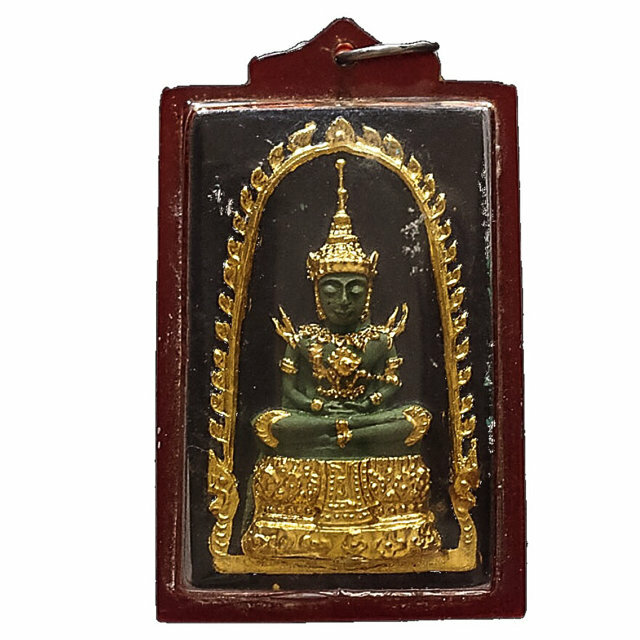 Pra Gaew Morakot Emerald Buddha Black Bailan Powders with Gold Leaf and a rare example with Green painted Image, from Luang Por Tong Rerm and Luang Por Rerm of Wat Juk Gacher, with Casing Included - A preferred Classic from the Tamniab Wadthumongkol Pra Gaeji Sai Chonburi (Preferred Pantheon of amulets of Chonburi Province Masters), the Pra Gaew Morakot 2512 BE Pim Song Ruedu Rorn Nuea Pong Long Rak Pid Tong Pim Niyom Block Chang Kasem Hlang Yant Duang Prasut Pra Putta Jao - by Luang Phu Rerm, of Wat Juk Gacher Blessed in Buddha Abhiseka at the nearby temple of Wat Bang Pra, in Sri Racha, Chonburi. The Pra Somdej Pra Gaew Morakot were made and released in the 2512 - 2513 BE period, in various models. 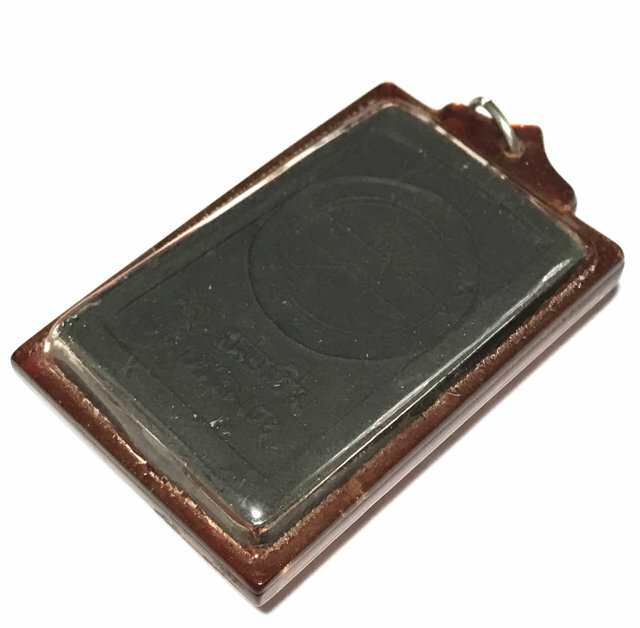 This exhibit is coated in black herbal lacquer and gold leaf, in Pim Yai, measuring 4.5 x 2.8 Cm wide, and is pressed from the preferred block press of the artisan Chang Kasem. It was Chang Kasem, who was the Artisan who created the blueprint molds for the amulets of the Great Jao Khun Nor, of Wat Taep Sirin. 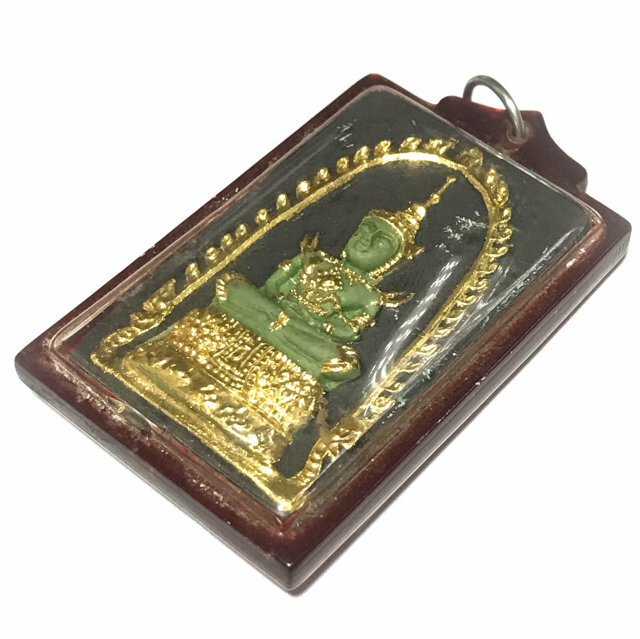 The front face of the amulet bears the image of the Emerald Buddha, in Summer Regalia, with gold painted embellishments. 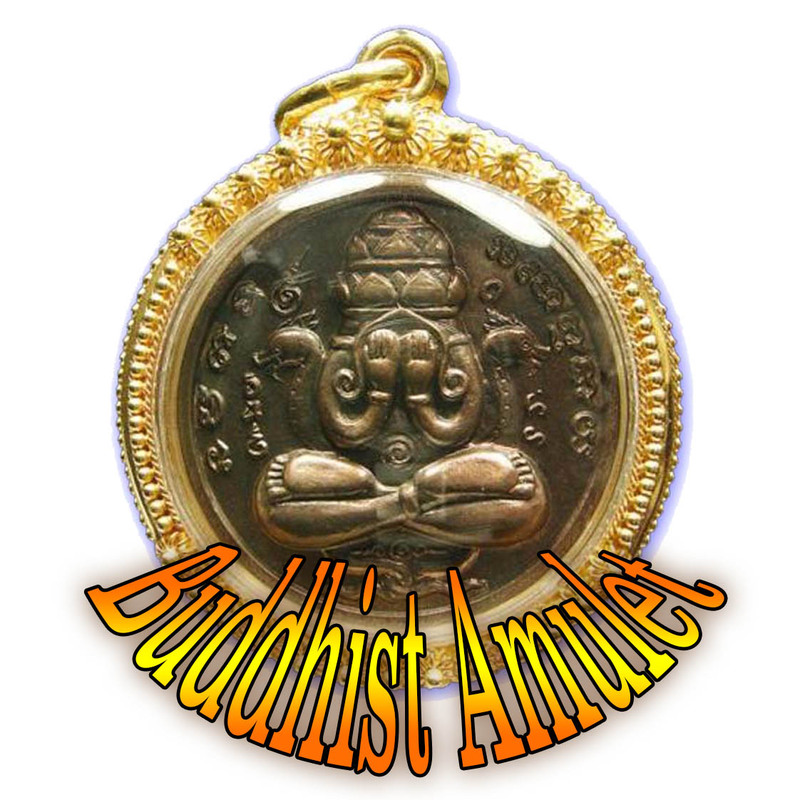 The rear face of the amulet bears the Sacred Yant Duang Prasut Pra Putta Jao, the Birth Date Astrological Sigil of the Lord Buddha. Below the Yant Duang, are the words 'Luang Por Rerm Wat Bang Pra'. 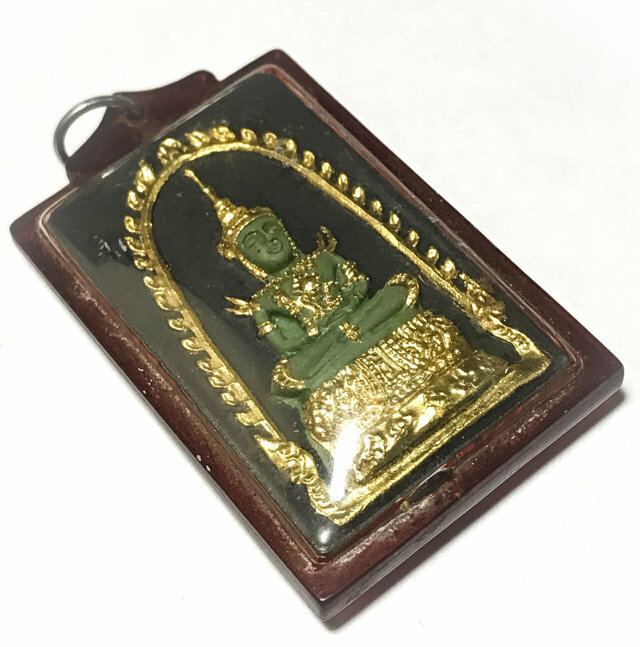 The Pra Gaew Morakot Emerald Buddha amulet was made in all the variations of seasonal robes, and is considered a signature amulet of the great Luang Phu Rerm, which has now become uncommon to find on the public marketplaces anymore, as the amulets of Luang Phu Rerm are fast disappearing as devotees and aficionados gather them up for their collections before it is too late anymore. 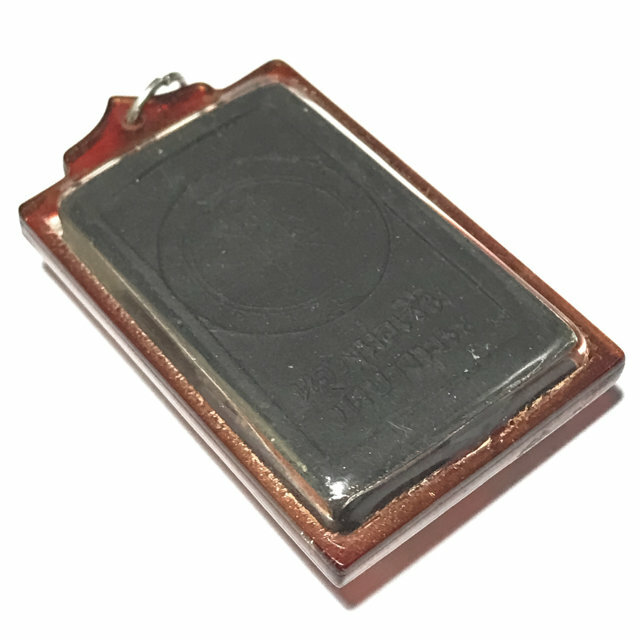 The Pra Gaew Morakot Long Rak Pid Tong amulets of Luang Phu Rerm are considered a Pra Niyom Category amulet that is known around the world for its great beauty, and for the Metta Maha Niyom Kaa Khaay Maha Lap Serm Duang powers it bestows upon the wearer. 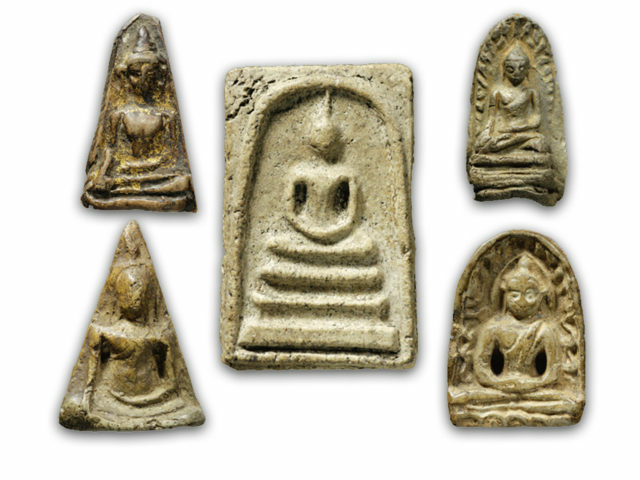 Luang Phu Rerm was extremely famous for his Mercy Charm and Wealth Increasing Magic, which is imbued within his amulets.